Growing up in the Pacific Northwest I loved berry season. It meant family trips out to the nearby farms to purchase berries by the crateful. Strawberries, raspberries and blueberries were my favorite. Oh, the anticipation of that first blueberry pie fresh out of the oven. 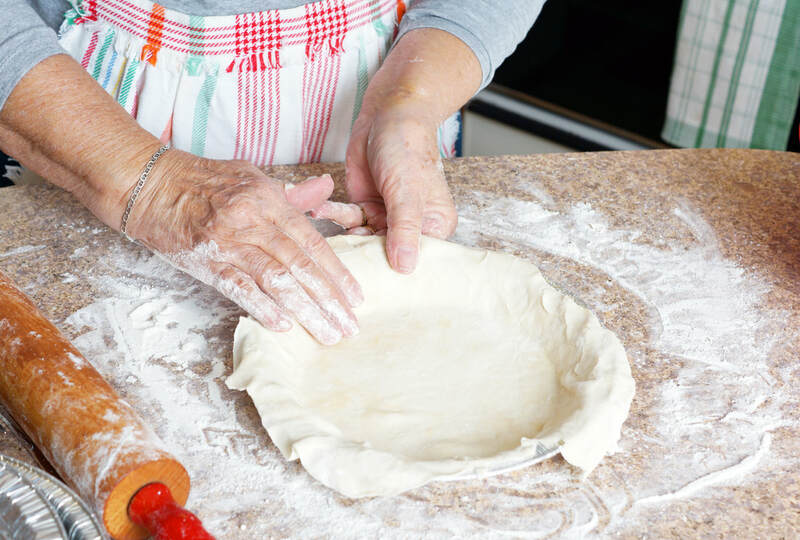 My pie crusts have improved over the years, but my mom was an expert at the flaky crust. 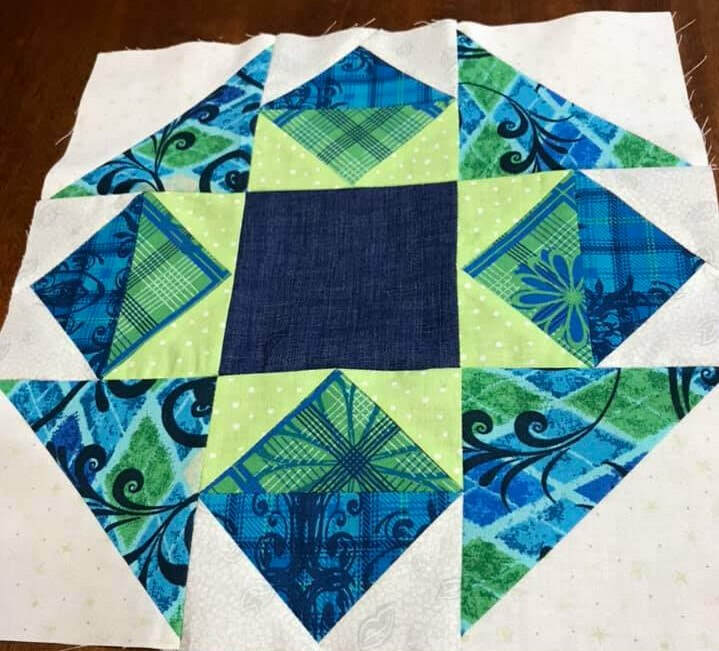 I have a few little tips to share with you about this month's block. 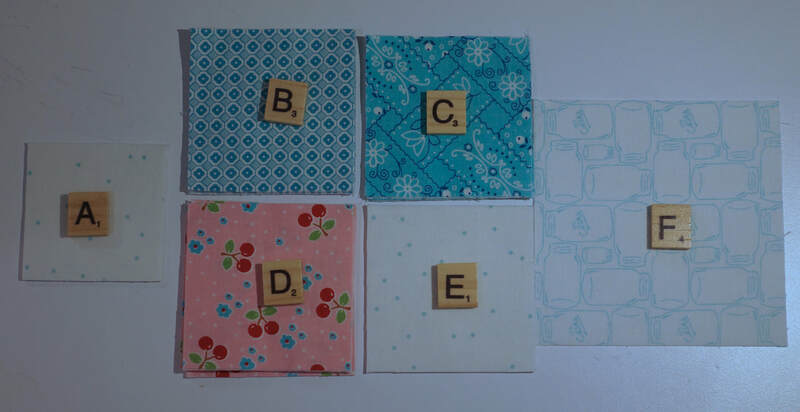 I picked up a bag of scrabble letter tiles and use these to label my pieces as I cut them out. 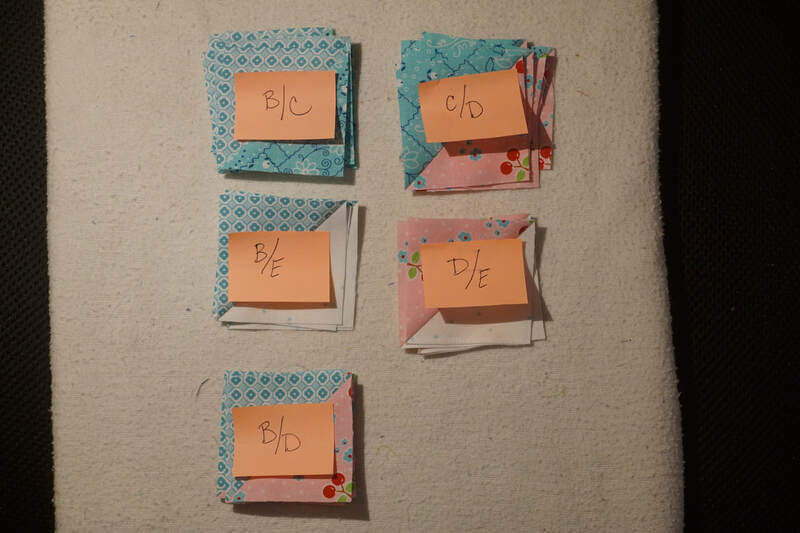 Labeling is especially important for this month's block. Another label I rely on are small sticky notes. 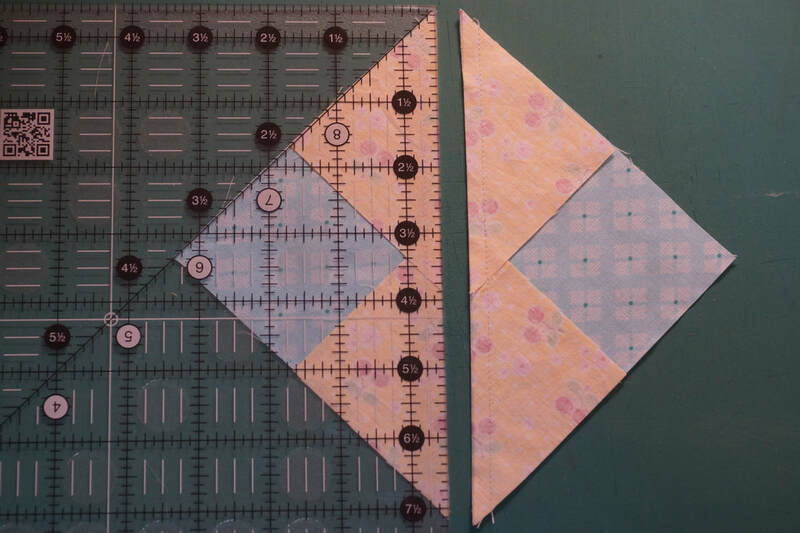 We have several combinations of Half-square Triangles to keep track of with this block and this really helped me to keep them organized. 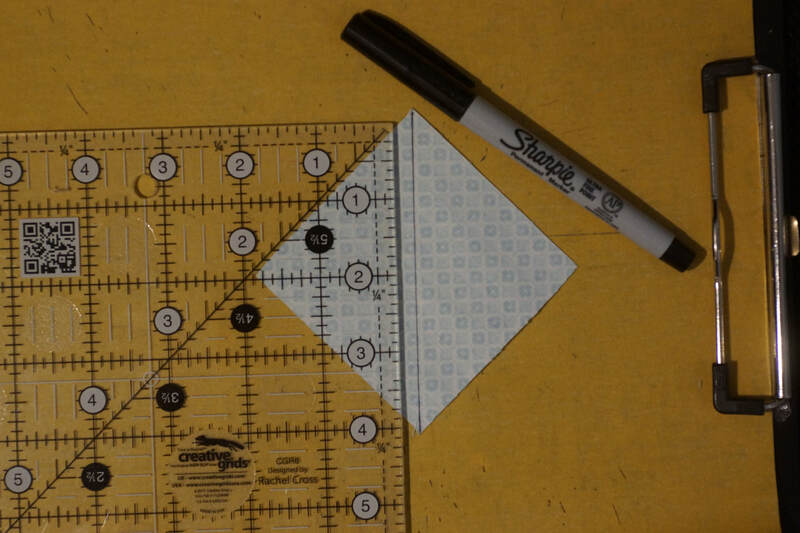 When drawing lines on the back of fabric as I prefer to do when needing to sew a diagonal line, I use a piece of very fine sandpaper that is attached to a clipboard. This keeps the fabric from slipping as I mark it. 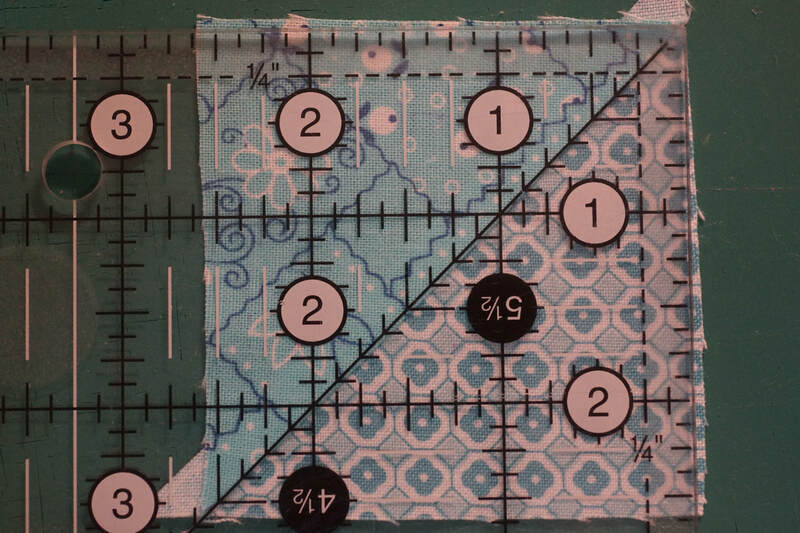 I know that a lot of quilters just eyeball sewing those diagonal lines, but I find I like the precision I get with taking the time to draw the lines. 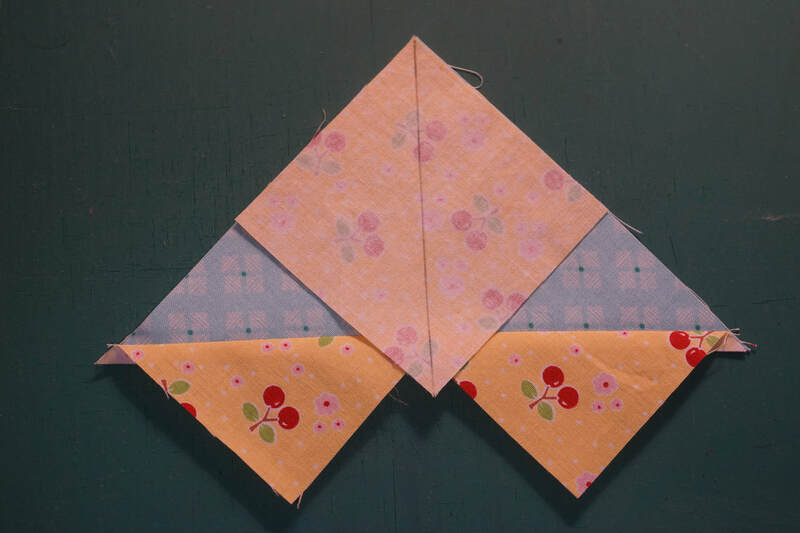 As I made the Half-square triangles I worked with only one combination at a time. This kept me from mixing up which one was which. 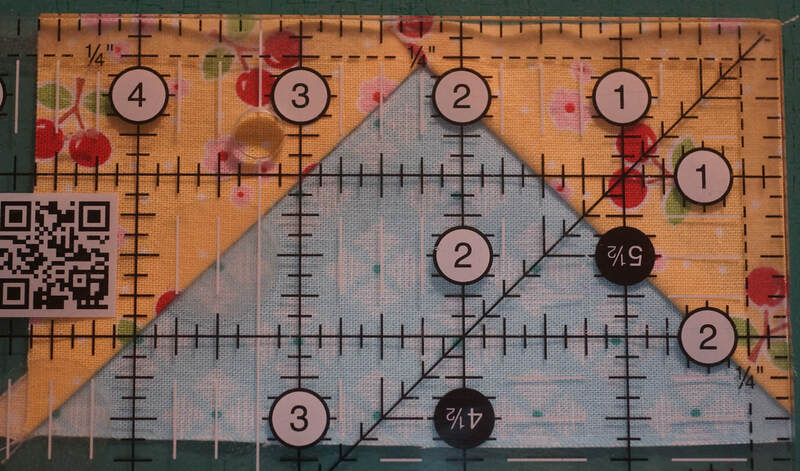 I do like my Bloc Loc rulers and this one works great for trimming these units to size. 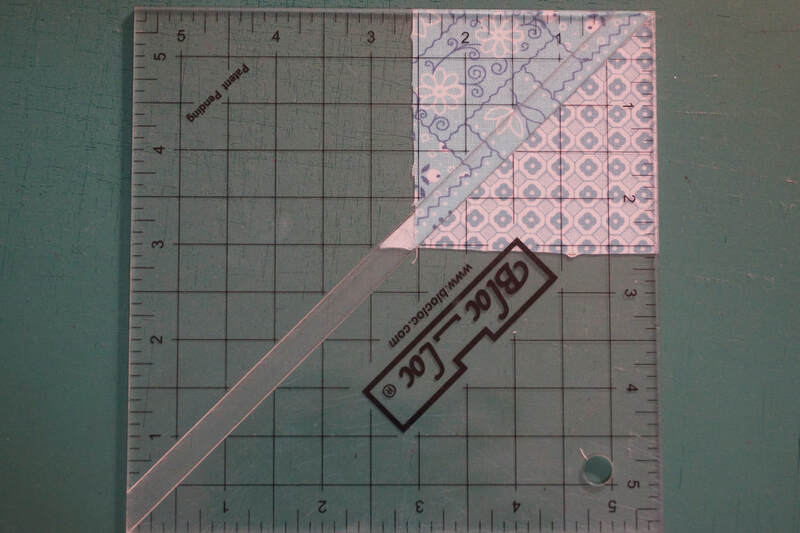 With a regular ruler you just need to make sure that your seam line is lined up with that diagonal line on your ruler as you trim. 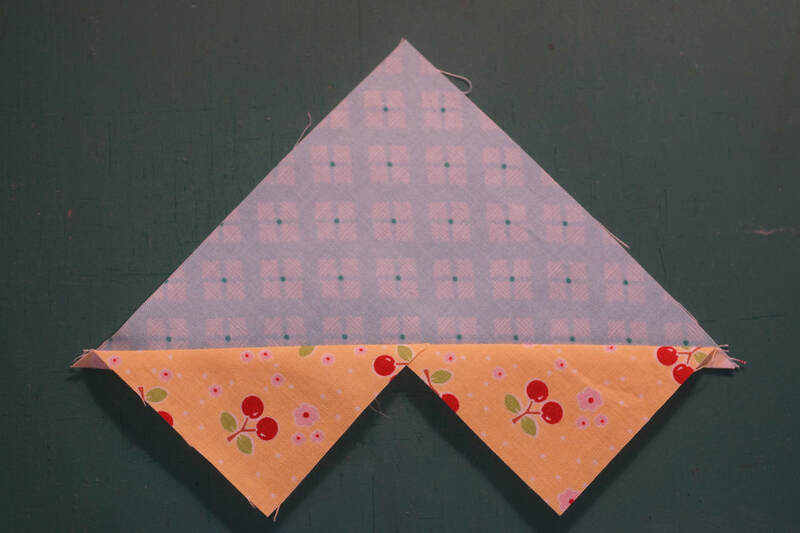 This will ensure that your Half-square Triangles come out perfectly halved with the two different fabrics meeting at the corner. As I mentioned, I worked with just one combination at a time and made sure to label as them after trimming. 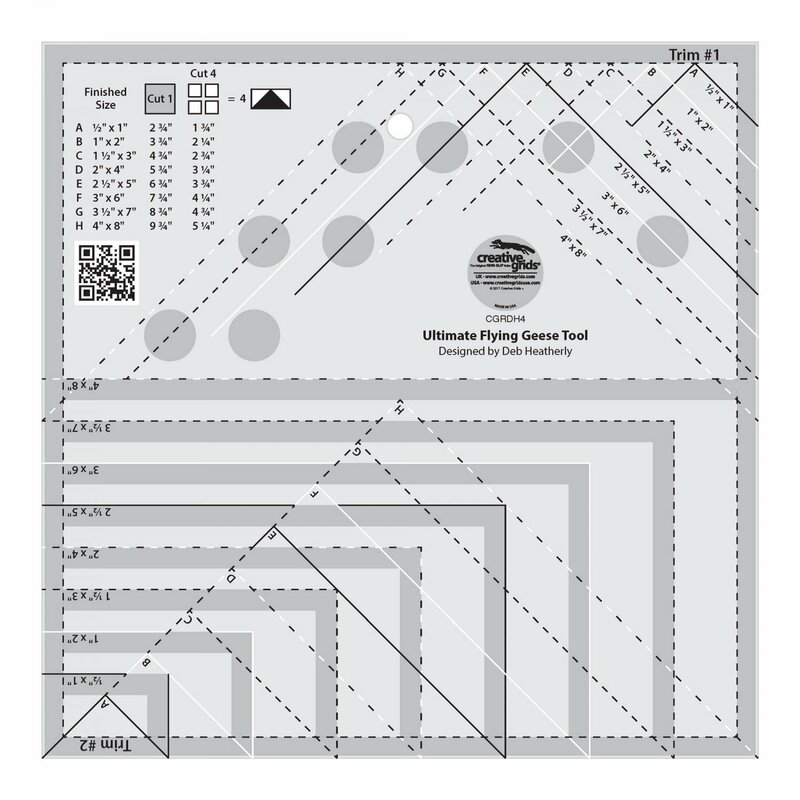 This really helped when it came time to put the various units together that make up this block. 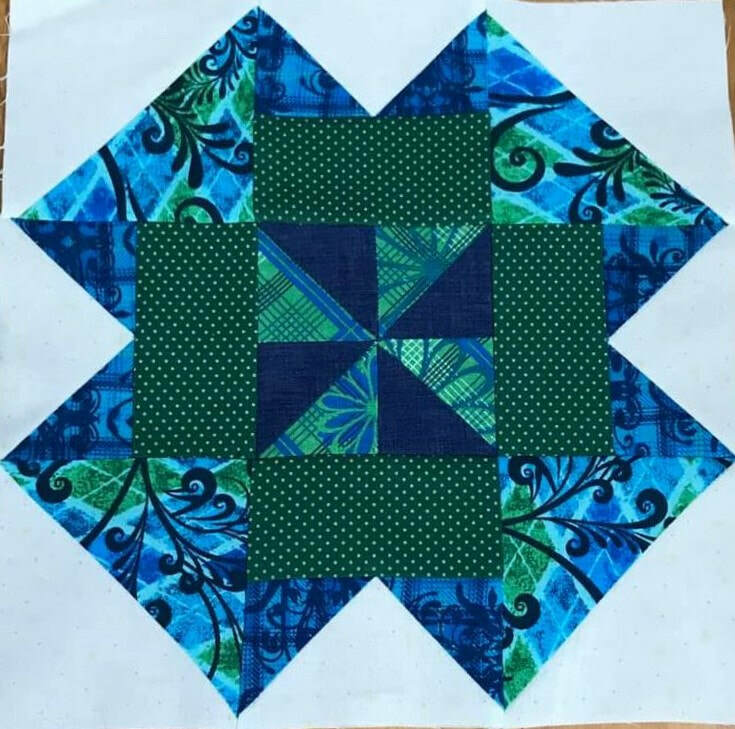 I have given very precise pressing directions for this block which will aide in having all of the various seams work with each other to allow this block to go together nicely. 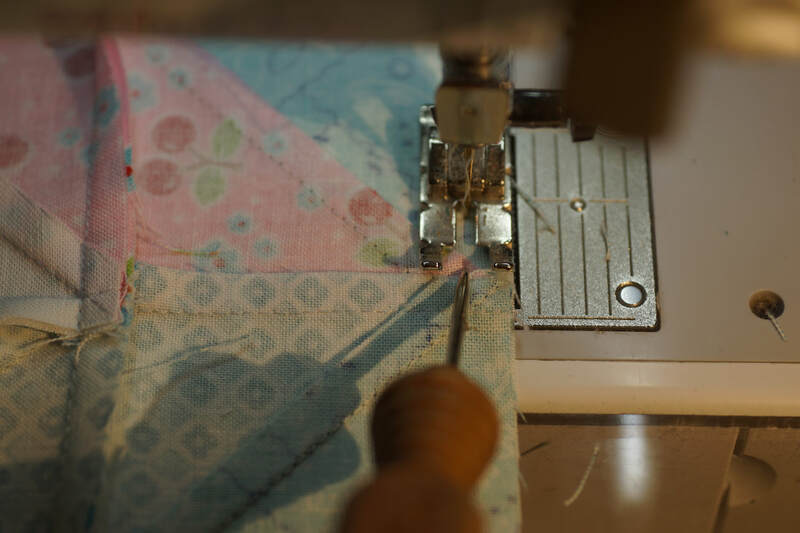 Whenever possible having "locking seams", seams that go in opposite directions, really helps in achieving those sharp points we all desire in our work. 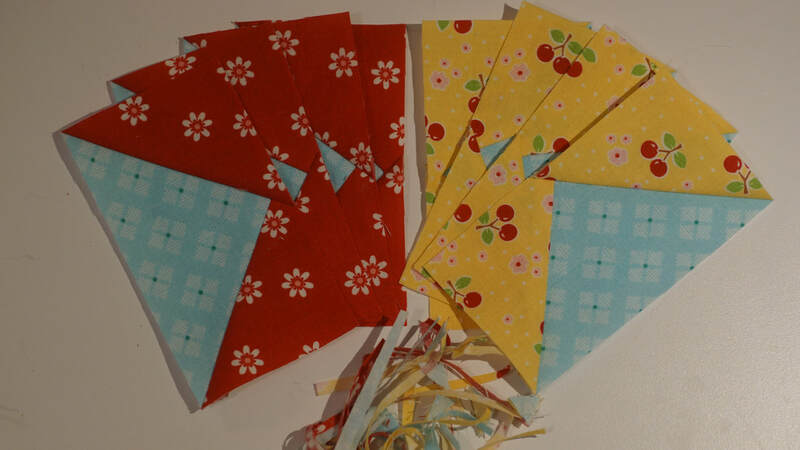 The drawback is that we can end up with some bulky seams to sew over. 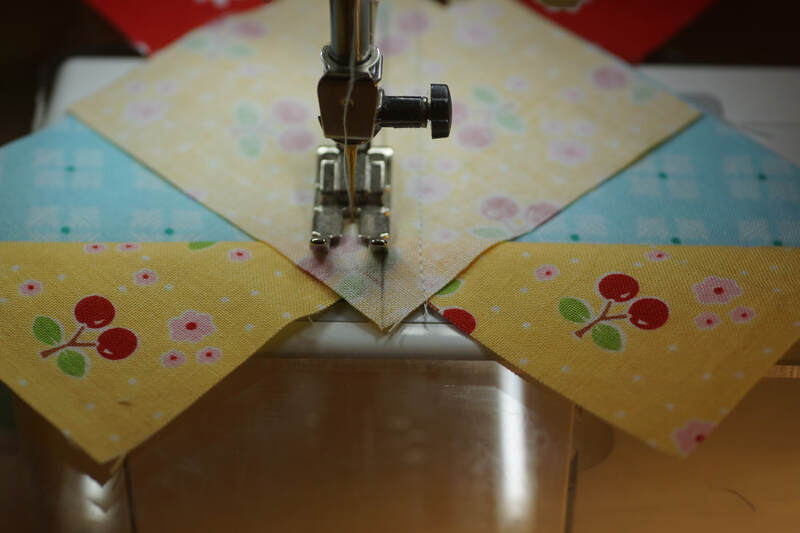 My tip: sew very slowly over those seams and pin as necessary. 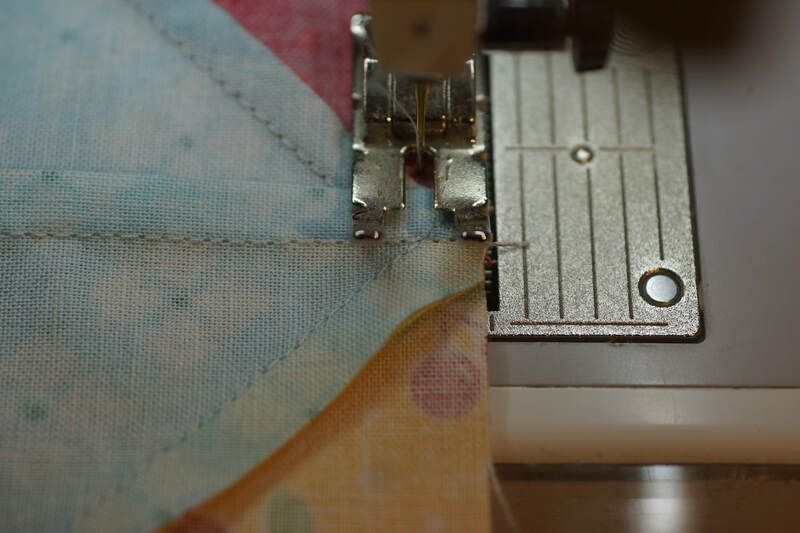 I always place a pin when my top seam is facing away from needle as shown here. 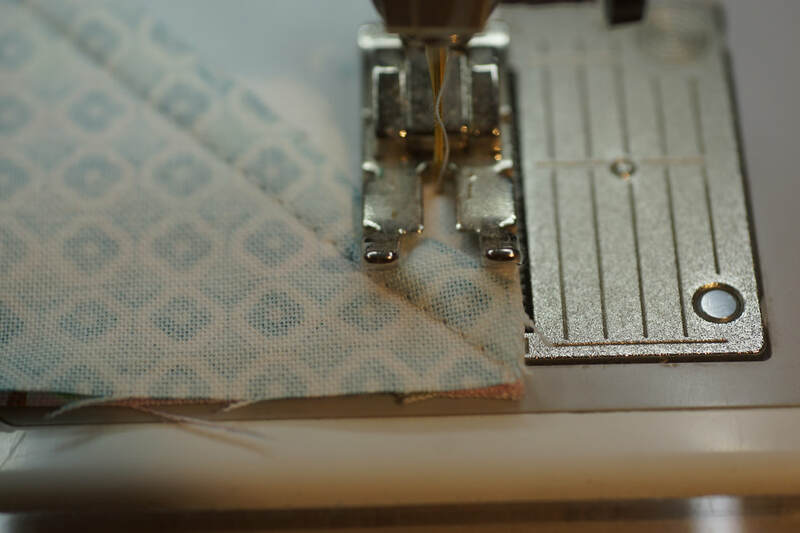 These are the seams most likely to get pushed out of alignment as I sew. 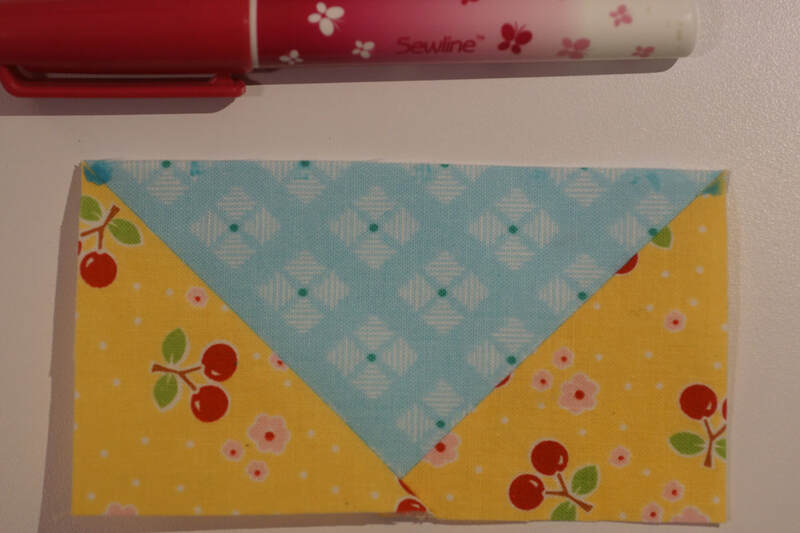 However, when the top seam is facing towards my needle it will tend to get pushed into the seam underneath and things usually line up quite nicely even without pinning. 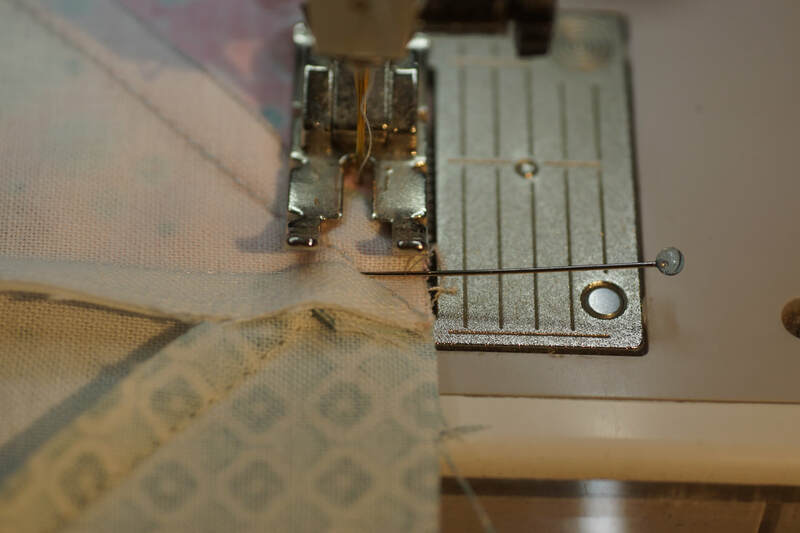 Sometimes it also helps to use a stiletto to hold down that seam as it goes under the needle. 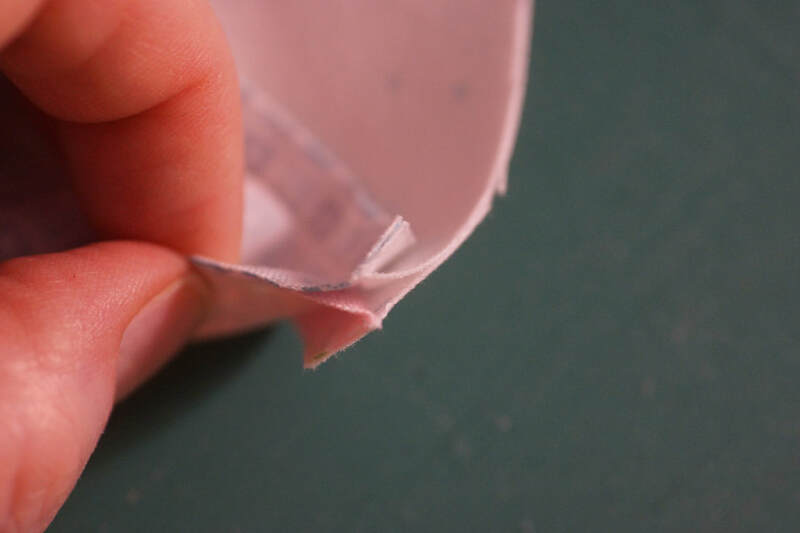 Again, sew slowly over these bulkier seams to keep your stitches nice and straight. 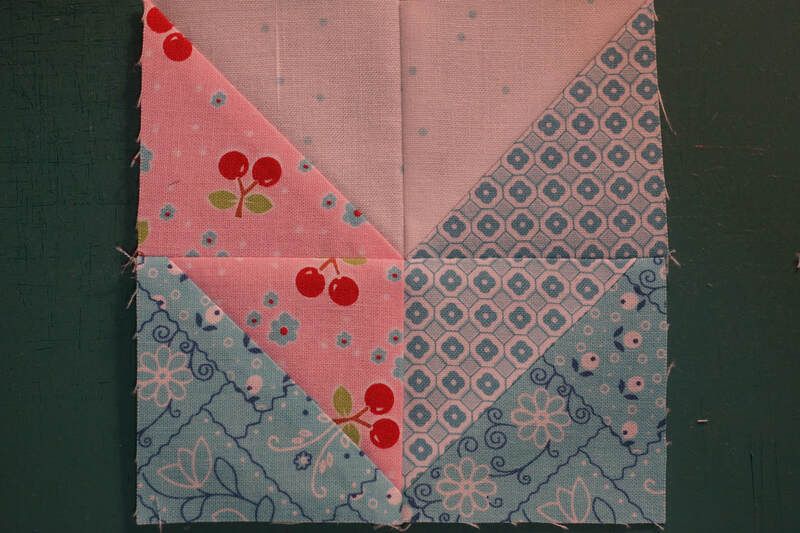 Learning to slow down as I sew has had one of the greatest impacts on the precision of my piecing. 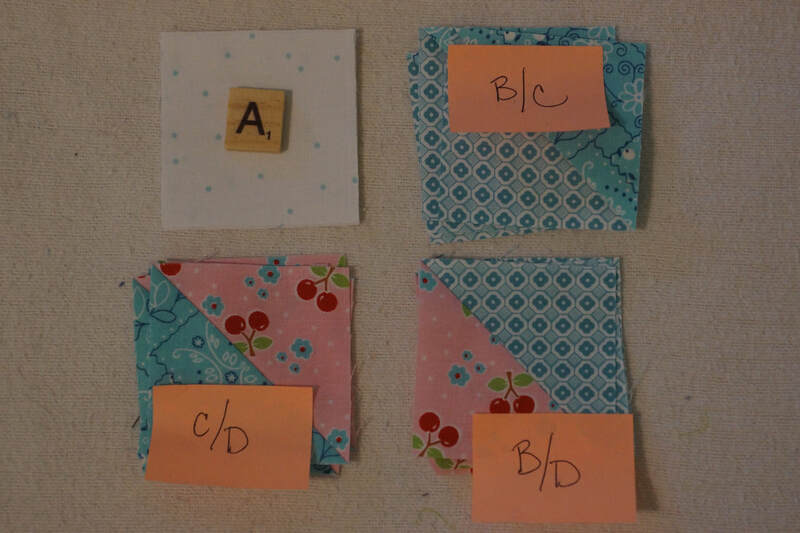 All of these tips are the things I do to end up with units that come out nicely when several seams meet up. 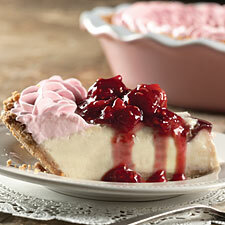 I hope they are equally helpful to you as you make your own version of Blueberry Pie. 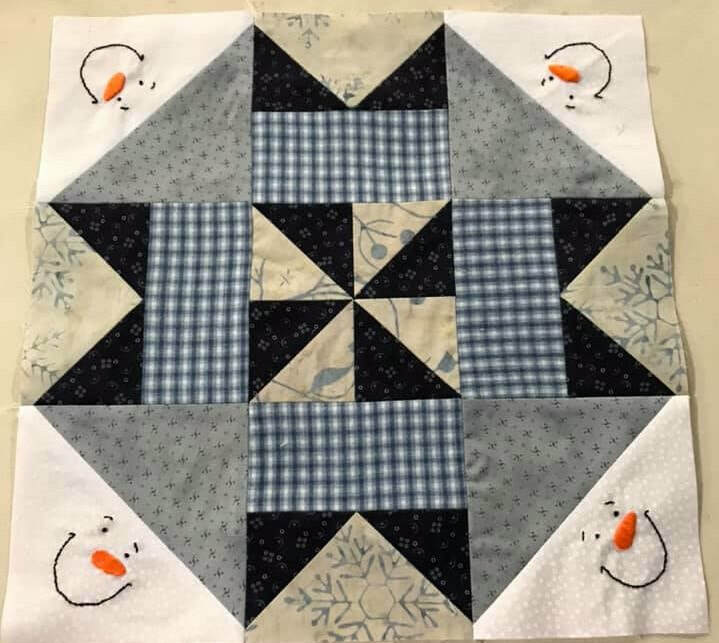 Be sure and join me on my Facebook Sew Along group page to share photos of your blocks, ask questions, and sew along with a really fantastic group of quilters with all levels of experience. 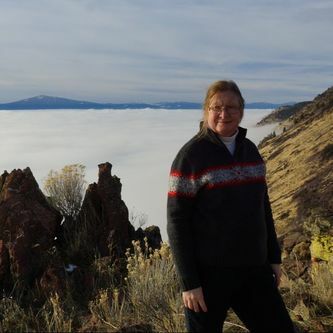 Request to join that group here. 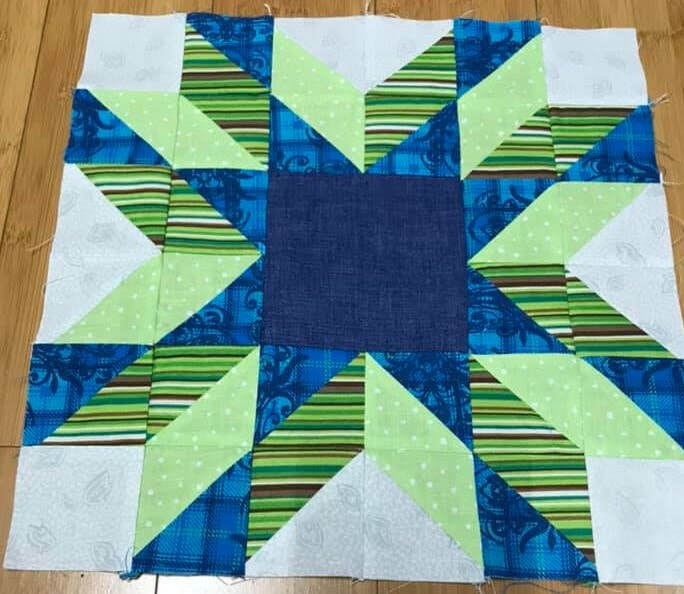 I am blessed with some amazing pattern testers who enjoyed this one too. Here are some of their blocks to further inspire you. For previous patterns in this series click here. 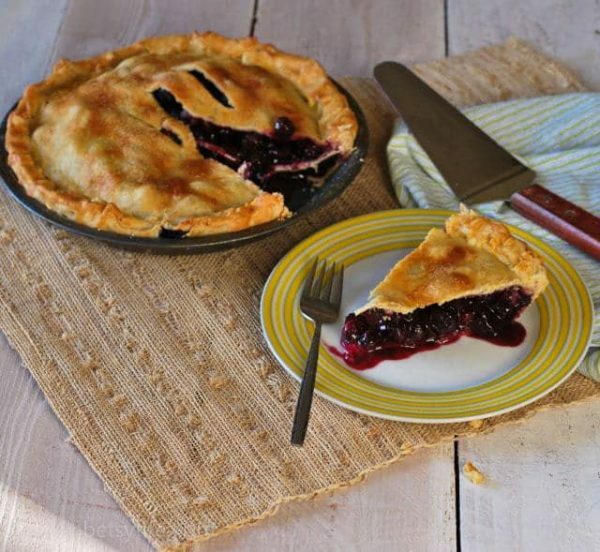 Visit BetsyLife's blog for her Classic Blueberry Pie. Happy April 1st! 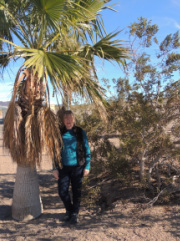 We enjoyed Spring Break here last week and laughed about our "spring" weather of snow, hail and rain. When the flowers finally do come they should be gorgeous after all of the moisture. 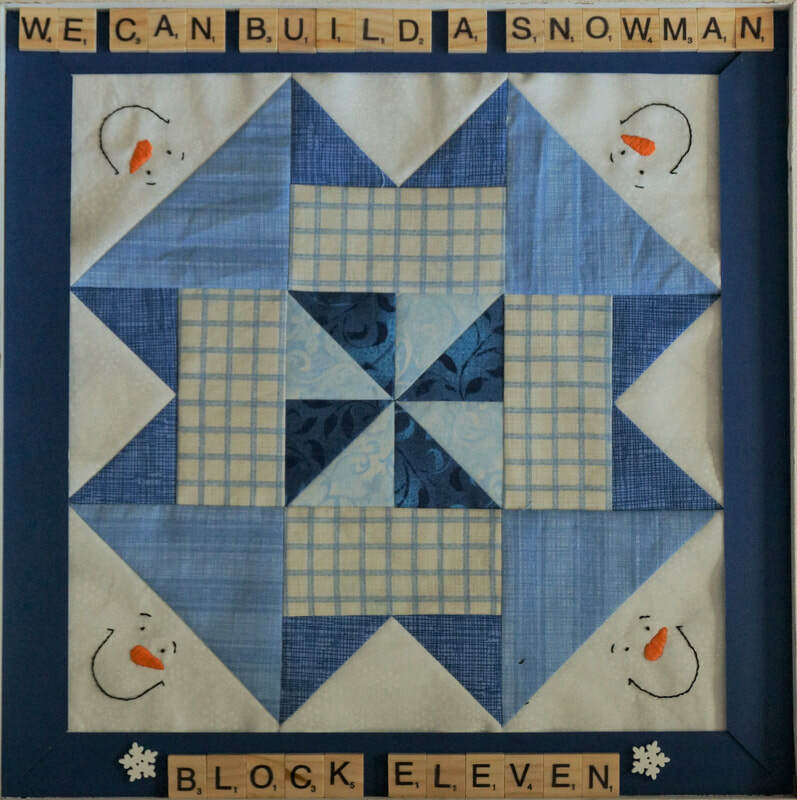 I hope you enjoy this month's block as much as I did. 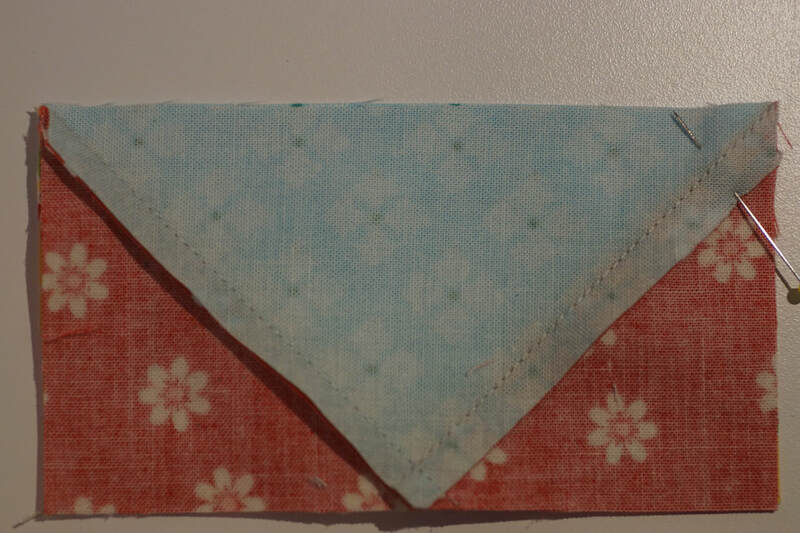 Flying Geese and Half-square Triangles make up this one. 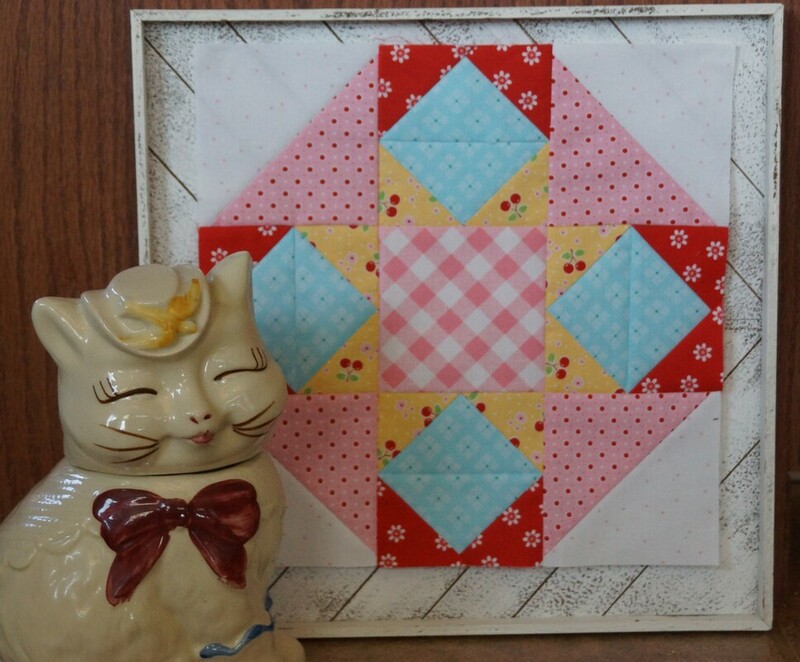 You can download a pdf of the pattern by clicking here. My testers had fun with this one too. With or without the snowmen they all look great. It's hard to believe we are nearing the end of this BOM. 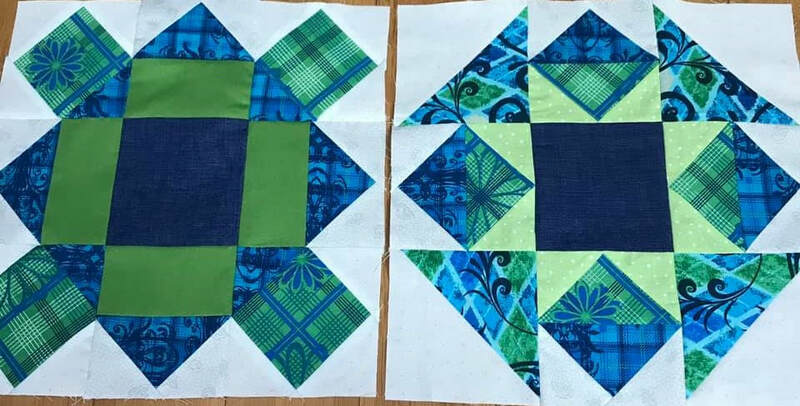 Next month for those that are doing the 12 block version it will be time to finish your quilts, the rest of us have Block 13 to look forward to that will be featured in the center of our quilt.